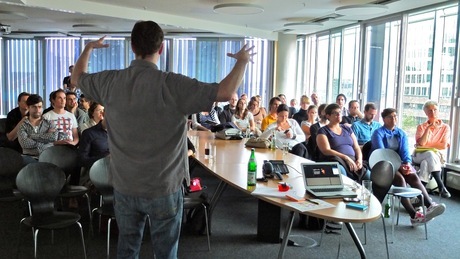 James Kalbach at User Experience Roundtable Hamburg, 2-Jul-2012: Business Model Design for Designers. More and more it is critical for companies to approach business model development creatively. Thebusiness model canvas is a tool created to do just that. But it's not just for managers: designers can also be involved in inventing and testing new business models, leveraging our creativity and exploration skills. But without direct exposure to senior management, it's hard to have any concrete impact on a business model in practical terms. In this presentation I'll show you what the business model canvas is and how designers can use it directly in their daily work. Additionally, I show why the business model is relevant to designers and how to understand them better. James Kalbach works as Principal UX Strategist for USEEDS°, a leading design and innovation consultancy in Germany. James holds a degree in library and information science from Rutgers University, and published his book on Designing Web Navigation (O'Reilly) in 2007.